Cracking a wireless network's security is known as WiFi Hacking. Wireless networks are more prone to hacking as compared to wired networks. There are two ways to make a WiFi's security vulnerable. One is by weak encryption, and the other is by poor configuration. In this article, you will be informed on how a wireless network is hacked and how to protect your network from WiFi Hacking? A wireless network without any protection is very insecure. Anyone can eavesdrop on you or use your network without your knowledge. Therefore, the standard networks were upgraded with Wireless Equivalent Privacy or WEP, which makes your network secure in three ways. It makes sure that the people who are using your network, are authorized to use it‚ it protects your privacy and makes sure none of your personal data is altered. By now many people have claimed WEP as ineffective. In 2007 another upgrade was added to the standard network, which is known as WPA2‚, it uses better authentication and passwords than WEP and is more secure than it. Many wireless routers use MAC addresses for computer authentication, and it secures your network from being used by other parties‚ but again an experienced person can hack into your network by using fake MAC addresses, so it's not secure. Similarly, it has also been thought that switching off the SSID broadcast gives strength to a network's security‚ but computers using disables SSID have been found insecure. So, WiFi networks supporting WPA or WPA2 are considered more secure. A wireless network with a WPA2 password of 12 characters‚ including numbers and both uppercase and lowercase letters, not spelling any name or making any pattern‚ a disabled WPS‚ non-default SSID and no wireless device using it is considered Non-Hack able WiFi. WPS has a vulnerability through which its eight digits long password can be divided into half and a half which makes the possible combinations of password lessen. Manufacturing companies have cured this default by providing router lock down. This means, if a WiFi network is tried to access using multiple incorrect pins‚ the network will automatically get locked. It will take few hours to unlock the WiFi or in some case you need to reboot it. Without a lock down feature‚ an enabled WPS supporting WPA2 wifi can be hacked within 5 hours using brute force WPS attack. 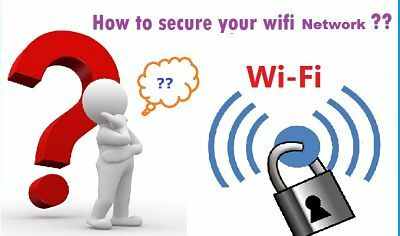 you just read the article about How to Protect and Prevent your WiFi Against Hacking and can you bookmark or share with link https://ghchjgv.blogspot.com/2016/09/how-to-protect-and-prevent-your-wifi.html so thank you.